Alright everyone, hear me out, or correct me if you think I’m totally wrong, but I’m beginning to think that “summer” should be classified as an emotion. Or, better yet, a state of being. Think about it: what is summer, other than the typical clichés of nighttime beach parties, backyard barbeques and water parks. While summer is definitely composed of those things, I firmly believe there’s a feeling in the air when you wake up that is purely attributed to this time of the year. Now don’t get me wrong, none of this is bad! It’s perfectly fine, and a very nice way to live for a few months, but sometimes this seamless existence can seem a little too…evanescent. Whimsical spontaneity is good, necessary even, but sometimes it feels really good just to plan out your week. Even if it’s something as simple as jotting down the time you’re going to dinner with your friends, the feeling of making a plan and subsequently fulfilling it is a pleasure we all can relate to. This, my friends, is exactly where an organizer would come in handy. More specifically, the 2013 Filofax Personal Blossom Multi Organizer. The Personal Blossom is a 135mm wide and 190mm tall personal organizer designed by a finalist in Filofax’s annual Graduate Design Competition. 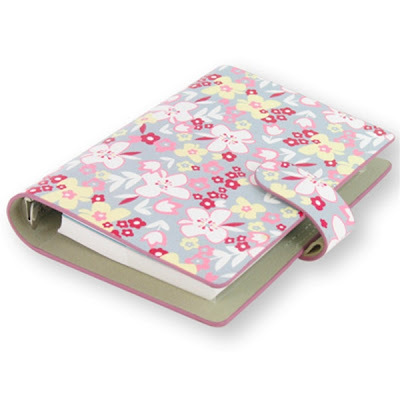 A beautiful, pink-themed floral print design is emblazoned upon the leather emulated binding. 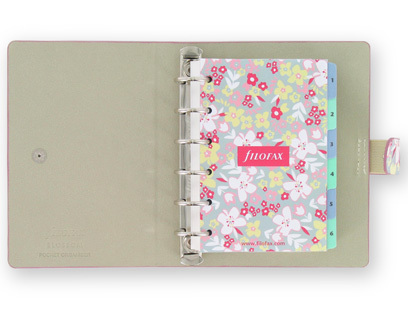 The personal organizer’s interior is composed of a creamy, suede-touch PU. There are 6 binding rings 23mm in size that holds 35mm of paper. As any writer will tell you, no matter how hard we try, we all know that it’s extraordinarily difficult to write something that perfectly reflects the feelings and sensations memories can so readily and effortlessly provide. They’re a seemingly perfect storybook and have the ability to shape not only how we see our pasts, but how we see our futures. Yet, despite their powers, memories are not time proof. They fade, blur, and are mentally rewritten more times than people care to think about, and this is what makes keeping a written keepsake so important. The Multi-Organizer is the perfect tool to make sure all your warm, refreshing summer experiences are never forgotten. Whether you scribble a quick note about your trip to the local renaissance fair, or write a ten-page vividly detailed description of the event, the organizer will always be there to protect and hold your recollections, no matter what they might be. So, once you’ve had your fun, sit back, relax, and write yourself something that, 50 years from now, will fill you with the same amount of enthralling excitement you felt when you experienced it. Trust me; it’ll definitely be worth it.